Cleo the Cat is Back! Come Here, Cleo! was one of the first books from Barefoot that we read, and my daughter and I were instantly in love...Cleo is such a sweet and gentle cat...she's curious and goes on adventures, but everything turns out fine in the end! ...then after the familiar opening, Cleo is off on a different adventure in each book! Cleo the Cat is our first introduction to Cleo...she sets off on a walk one morning to find herself a home, and meets a little boy who offers her a bowl of milk and a warm lap. Next comes Come Here, Cleo! In this one, Cleo explores the garden and finds that it is full of surprises. As Cleo explores, little ones will learn action verbs such as climb, jump, slip, hop, roll, and bounce. In Cleo and Caspar, Cleo isn't too sure about the new puppy in the house and takes some time to decide if she will be friends with him. This is a great book for teaching young children how to make new friends or even how to welcome a new sibling into the house! Once Caspar settles into the family, they all enjoy some winter fun in Cleo in the Snow. And finally, Cleo and Caspar and the boy embark upon a grand adventure in Cleo on the Move - moving to a new house! Caroline Mockford's bright illustrations are perfect for keeping little ones interested, and the stories are simple enough for children to follow and relate to. 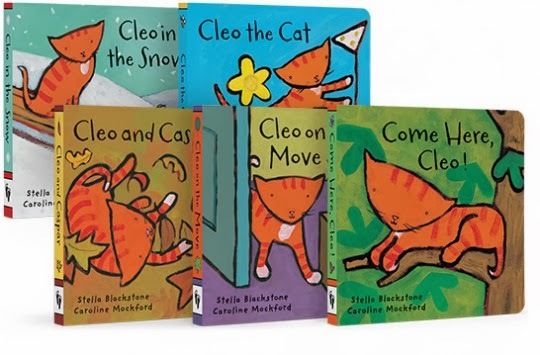 Each of the Cleo books is available for just $6.99 in either board book format or paperback. The sturdy board books are great for younger children and will last forever; paperbacks are nice for kids who are starting to learn how to read - the story is simple enough for them to master and build confidence while the paperback format won't make them feel like they are reading a book for babies. And right now, you can purchase all 5 of the Cleo books for the very special price of just $29.99 (regularly $34.95). The Curious Cleo Gift Set is just one of the Dazzling Gift Sets available from Barefoot during the holiday season! We're so glad Cleo is back! PS - if you are ordering for the holidays, check out the handy Barefoot holiday shipping guide!